This was a funny story, but I had trouble following the dialog a lot of the time. It's very thick and although I can listen to a Scottish person speak and generally follow them, it doesn't translate well to writing. Despite that, it was an enjoyable book. 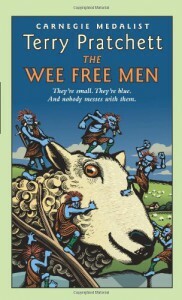 The wee free men seem to encompass all the folklore about little people and they get up to some hilarius hijinks.